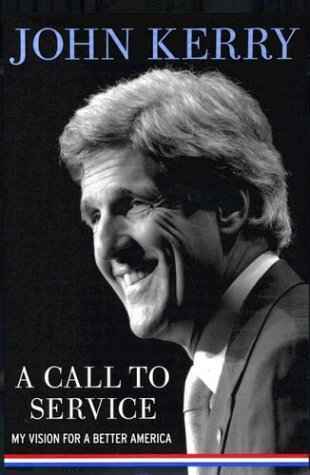 Click here for 32 full quotes from John Kerry in the book A Call to Service. Base policy on broad growth and progressive taxation. Voted for PATRIOT Act, but genuinely alarmed at PATRIOT II. Regulate on side of citizens, not on side of corporations. Offshore tax havens cause higher middle class taxes. Bush wants to eliminate federal assistance to local police. Supported �No Child Left Behind,� but Bush reneged. Stop viewing charter schools as threatening innovation. Nothing good about vouchers can�t be done in public schools. Dismissal of Kyoto indicative of Bush�s unilateralism. Drilling for oil doesn�t gain energy independence. Apollo project approach to energy independence. Make environmental justice an EPA priority. Simultaneously address costs, coverage, and choice. Cut $350B of bureaucracy and cover 90% of Americans. The New War: We are no longer safe at home. Modernize the Middle East to prevent future terrorism. Invest billions to secure loose nukes abroad. Focus on first responders instead of duct tape. Weekly economic policy summit to create jobs. Redeem promise for a better America for our children. Bush broke his three biggest campaign promises. Campaign built around a call to service. Raised Catholic, but family history includes Jews. Persecuted Catholics rely on church-state separation. GOP tax policy comforts the comfortable. Invest in high-speed commuter rail & double-dip benefits. Member of �Digital Dozen� of tech-savvy legislators. Supported Kosovo action & Powell Doctrine. Palestinians renounce right of return; get treated equally. Ok for government to partner with non-profits & for-profits. Expand EITC as anti-poverty measure. The above quotations are from A Call to Service, by John Kerry, published Oct. 2003.